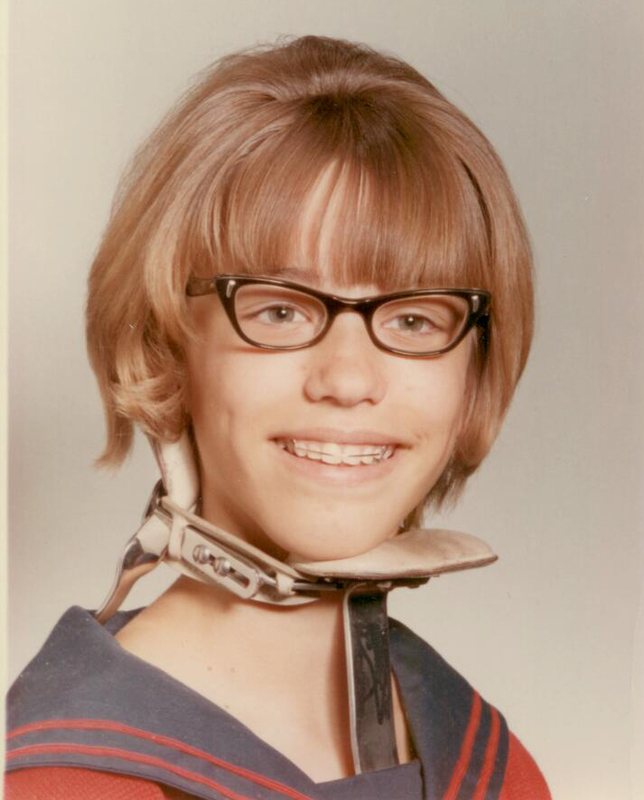 Then I imagine what junior high must have been like for my mom, who went through all of that while wearing a Milwaukee brace for scoliosis, and I suddenly feel much less sorry for myself. My mom had adolescent idiopathic scoliosis (AIS), a condition in which the spine curves sideways in a C or an S-shape, sometimes causing the patient's ribs, hips or shoulders to appear unbalanced. AIS affects 2-4% of teens, most often girls, and develops during the growth spurt between ages 10-14. It's called "idiopathic" because, despite intensive research, no one knows for sure what causes it: it seems to be the result of complex genetic and developmental factors that are still being identified, and it's possible that different patients develop similar curves, but for different reasons. Although AIS itself is mysterious, there is now definitive evidence that bracing - a treatment in which patients wear custom-built body braces with pads that hold the spine in place - prevents the curve from progressing to the point that it dangerously compresses the heart, lungs, or other organs. Despite the fact that a form of bracing has been used as therapy for scoliosis for 2000 years, previous studies on its efficacy gave mixed results. This was because researchers had no way to be sure whether patients were wearing their braces, or how much. Many teens who claimed they wore their braces the recommended 22 hours per day had bad results - was this because bracing didn't work or because the teens took their braces off when no one was around to catch them? Then came the BrAIST study, in which patients at 25 hospitals in the USA and Canada were given a choice of treatments: nothing, or full time wear of a Boston brace (a model that, although known to be less effective than the Milwaukee, is completely undetectable under most outfits). The twist? These braces were fitted with temperature and pressure sensors that detected when the brace was in use. There was no way to cheat. The results were so overwhelmingly positive that the trial finished early - bracing stops the progression of scoliosis. And for teens who may have to commit several of the most traumatic years of their lives to this treatment, that knowledge might make it all worthwhile. Do you have scoliosis, or know anyone that does? What was your experience of treatment like? What would you say to teens who have just been diagnosed with the condition? More information for patients with scoliosis is available in my book, Living With Scoliosis, which I wrote in memory of my mom. On April 20, 2015, University of Victoria graduate student Mike Irvine made history by defending his Masters thesis in real-time from 20 feet under the surface of the Pacific Ocean. The underwater presentation is believed to be the first of its kind. Wearing a mask that included a microphone and earbuds, Mike presented his thesis defence in front of an underwater web camera at James Island Wharf in Saanich, BC near Victoria. For a classy touch, he wore a rather formal pinstripe suit over his diving gear! His supervisory committee watched and conversed with him via videoconference from a classroom at the University of Victoria, and one of the committee hovered on the wharf above Mike. Another of the committee attended from her office at the University of Alberta. You might think that a presentation like this was by a marine biologist, but Mike Irvine is actually studying in the faculty of Education. His thesis is entitled: "Underwater web cameras as a tool to engage students in the exploration and discovery of ocean literacy." His presentation is 15min followed by questions from the committee, and it can be watched at this link. During his presentation, Mike was floating in front of a group of plumose anemones -- a sea creature that looks something like a big white head of broccoli or cauliflower. He had a surprise visit from a red rock crab, which waved its claws when Mike held it up. Though the audio of his presentation was not consistently loud and clear, his website is beautifully clear for those who want to learn more about the ocean and about teaching students ocean literacy. His Live Dives project puts the sciences to practical use, and gives viewers much of the feeling of being on a dive with him. For more information on future Live Dives, visit http://fisheyeproject.org/. CSWA 2014 Book Awards Short List Announced! And yes, I'm pleased as punch to point out that my own book, Zoobots, is on the Children's Book Short List. Best of luck to all the nominees! 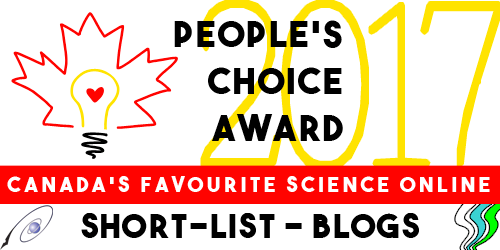 If you are a reader, you won't need luck to pick a winner from these lists - are all guaranteed to inform and delight. Zoobots by Helaine Becker, Kids Can Press. Starting from Scratch by Sarah Elton, Owl Kids Books. It’s Catching by Jennifer Gardy, Owl Kids Books. The Fly by Elise Gravel, Penguin Random House. If by David J. Smith, Kids Can Press. The End of Memory by Jay Ingram, Harper Collins Publishers Ltd.
Canadian Spacewalkers: Hadfield, MacLean and Williams Remember the Ultimate High Adventure by Bob McDonald, Douglas & McIntyre. Pain and Prejudice: What Science can Learn about Work from the People Who Do It by Karen Messing, Between the Lines (BTL). Is that a Fact? by Dr Joe Schwarcz, ECW Press. Bee Time by Mark L. Winston, Harvard University Press. The winners in each category will be announced on Canada Book Day, 23 April 2015. Winners will each be presented with a plaque and $1000 cash prize during an awards dinner held in conjunction with the CSWA ‘s 44th annual conference in Saskatoon, SK, held at the University of Saskatchewan 18-21 June 2015. Our Science Book List Hits its First Update!